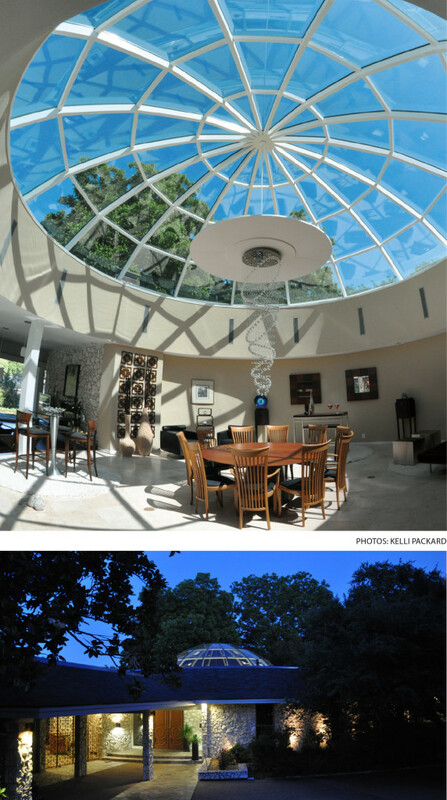 A 30′ diameter, sixteen-sided, white, round skylight still had the original single layer acrylic glazing, no sky view and was damaged by hail. The skylight did not meet current energy codes and could not be brought up to code because the structure was not strong enough to hold double glazing. Transition from the old white acrylic to glass posed another challenge. “Glass is reflective so you would be able to see the inside face of the new curb and the old lighting that surrounded the opening as it reflected off the glass on the inside, especially at night,” said Rob Packard, Skylight Specialists Inc. The client also wanted to hang her magnificent light fixture from the middle and incorporate a new “cloud” off the pole that held the fixture, designed to control sound and prevent echoes because of the shape of the skylight. Upgrading light quality and heat loss and gain was of utmost importance. 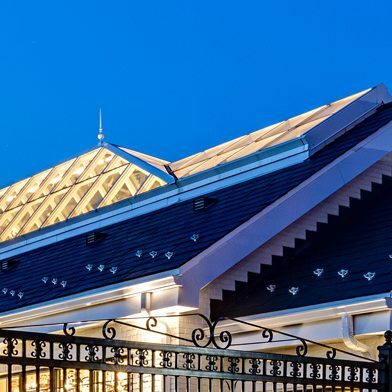 Wasco’s Pinnacle skylight system was chosen because of its thermally-enhanced construction, large span capability and fast on-site assembly and installation. 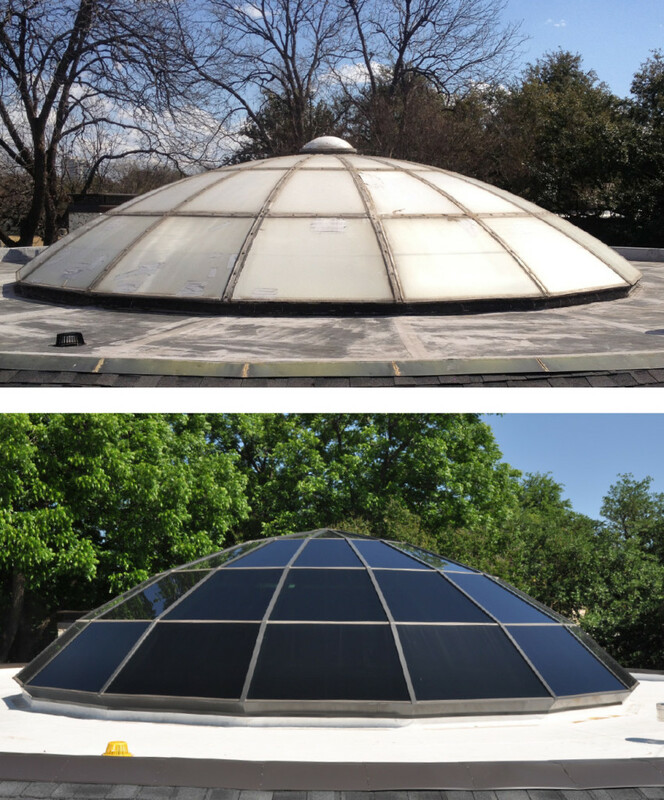 The new skylight retrofit was designed with the same amount of sides, but with more segments up the skylight and a slightly higher elevation for better aesthetics. A new curb was engineered that could handle the thrust loads of the new skylight. The old skylight was manually lifted and temporarily supported while new curbs were constructed. The existing frame was removed and replaced with the new skylight frame—assembled on the roof of the garage—by crane and was completely glazed within 36 hours. The home was designed with indirect, fluorescent lighting around the perimeter of the skylight. To avoid reflections of the lights on the glass at night, the inside of the curb was finished with white aluminum cladding and a white acrylic lens was designed to cover the lights. A white interior frame was recommended instead of the standard bronze frame for a more appealing look. 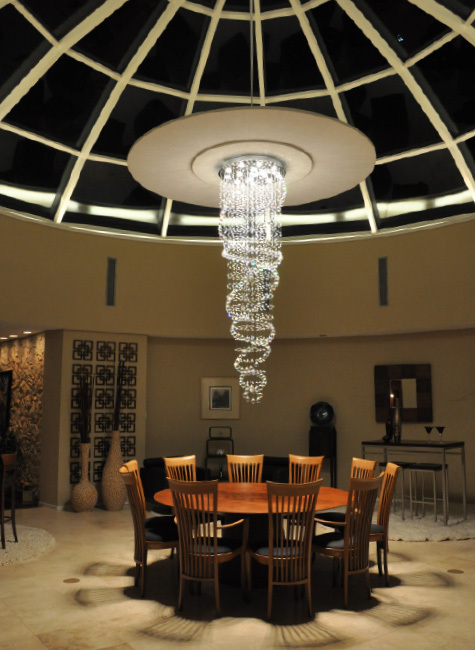 Additionally, at the homeowner’s request, a seven foot long chandelier and an eight foot sound-deadening “cloud” was suspended from the center of the new skylight retrofit—with the wiring hidden within the internal structure. A very dramatic, stunning look. Wasco skylight’s advanced glazing technology ensured that the building envelope was covered by an insulated system that delivers unequaled durability, hail resistance, daylighting performance…and a sky view! 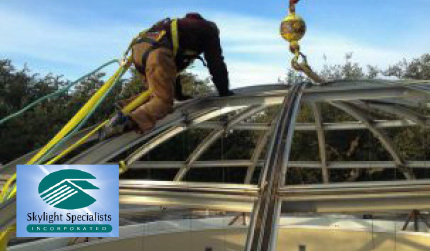 Proud of our high customer satisfaction and A+ Better Business Bureau rating, Skylight Specialists, Inc is a highly trained team of specialists experienced in all aspects of residential and commercial skylight construction, many of whom have been with the firm in excess of 10 years. Together, working closely with manufacturers, architects, and customers, we remain committed to creating better home and work spaces with the addition of natural daylighting elements. The spectacular sky view provided by the new skylight is stunning day or night. A magnificent light fixture hanging from the middle incorporates a new “cloud” designed to control sound and echoes. The original single layer white acrylic glazing had no sky view and did not meet current energy codes. The new system was glazed in only 36 hours, is hail resistant, energy efficient, and offers magnificent sky views!